· The scheme will now take a minimum of 25 weeks from today (LCC’s timescale) to administer the various consultation and council processes, so we won't see a scheme until Q4 this year at earliest. · SKDC will Re-issue for free, the on-street waivers and discounted car park tickets to existing holders, these will all expire on 31st December 2014, or earlier if the scheme is adopted sooner than that date. · Waivers and tickets with accompanying letters will be mailed out today. · A communication will be in the Mercury on Friday. While the delay is not great news, it does mean there will be proper consultation for anyone living in streets where there will be new parking restrictions (especially Vine St and Conduit Rd). A number of you already have interim parking waivers, but if you haven't you may be pleased to know that SKDC have reduced the price of these to £58. These permits will allow you to park in any time-restricted parking bays for as long as you want (except Broad St on Fridays). Permits are available from the SKDC office in Maiden Lane after 1 April - you will need to bring a utility bill and your V5c for any car you want to have on the permit to prove that it is registered to an address in the proposed parking zone. 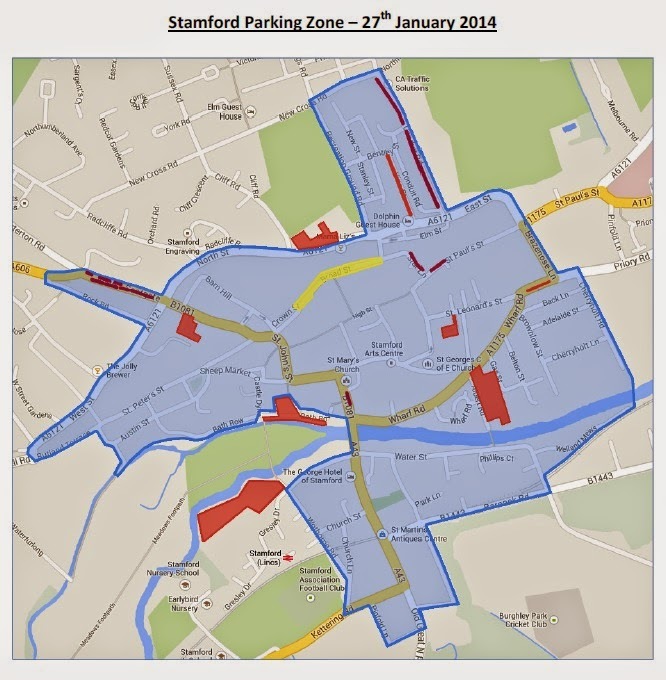 The interim parking waivers are valid until 31/12/14 or the introduction of a residents' parking scheme (if earlier). This should be very welcome news to anyone who has recently moved into the centre of Stamford, or didn't buy a waiver when they first became available in 2012. The latest proposed parking zone that I have is attached. Anyone who has an interim waiver or discounted season ticket for the car parks should already have received replacements in the post. Red areas are SKDC car parks, the yellow area is the part of Broad St outside the zone and red lines are proposed changes to existing parking restrictions.